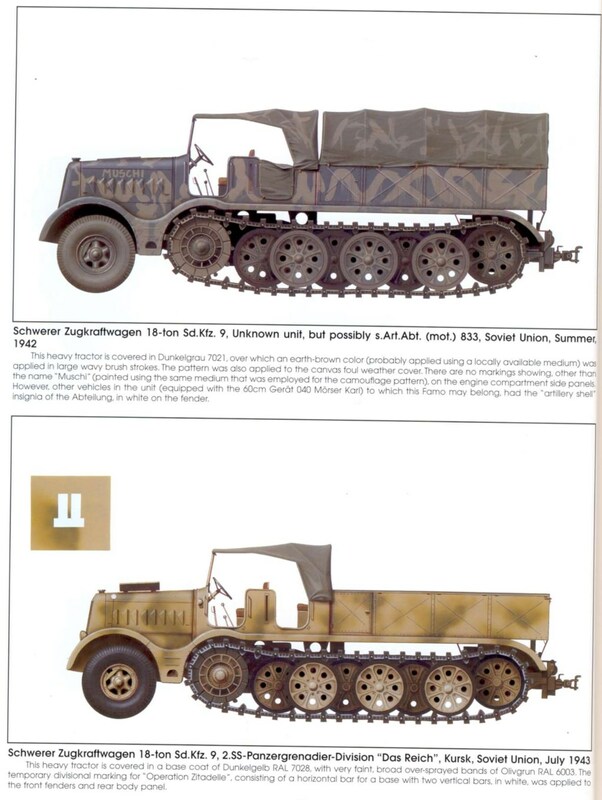 Much use was made in the German Army of ‘Zugkraftwagen’ (Zg.Kw), or towing tractors, with one or more steered wheels at the front and a tracked suspension system at the rear. 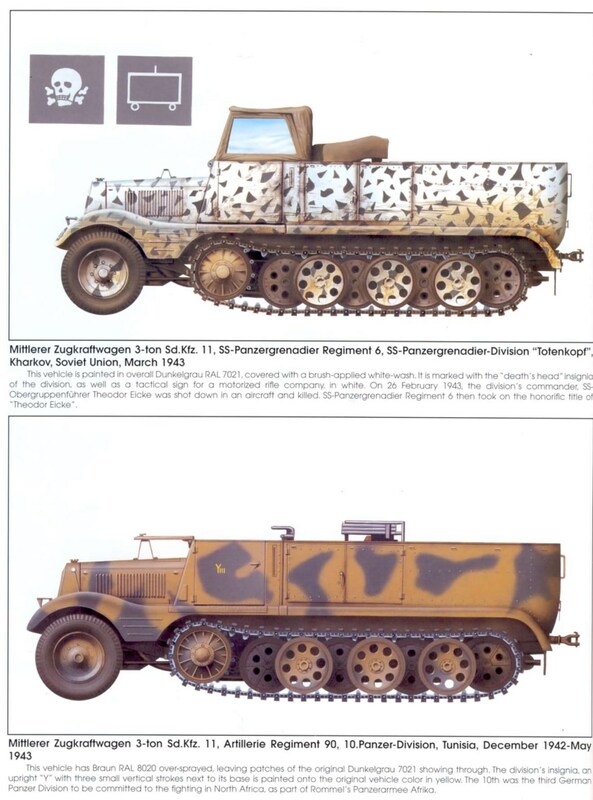 These were classified not by load· carrying capacity but by trailer load and would be referred to either by this means or by their special vehicle number (Sd.Kfz.Nr.) . As distinct from the Maultier (mule) vehicles, which were purely load carriers, these were solely for towing. The adoption of this type of vehicle followed experience gained during World War One with Daimler-Benz ‘Marienwagens’ and ·Kraft-Protze’. During 1932, a standardised family of semi-tracked vehicles was scheduled for production under the control of Wa. Pruf. 6 (Heereswaffenamt Branch 6), embracing a wide range of towing capacities. At first the army requested three basic classes-light, medium and heavy; but these designations were later modified and vehicles were classified according to their trailer capacity. The light class became the 5-ton, the medium the 8-ton, and the heavy the 12·ton class; during 1934 a parent firm was selected to conduct the design and development work for each weight class. At this time, two further vehicles were ordered-the 3-ton class and the 1-ton class; and during 1936 the last class (18-ton) was ordered. Other firms were requested to assist in production whenever necessary. 8-ton, developed by Krauss-Maffei AG, Munchen. 5-ton, developed by Bussing NAG, Berlin Oberschbnweide. 12-ton, developed by Daimler-Benz AG, Berlin Marienfelde. 3-ton, developed by Borgward (formerly Hansa-Lloyd-Goliath AG), Bremen. 1-ton, developed by Demag, Wetter/Ruhr. 18-ton, developed by Famo, Breslau. Each firm was responsible for the development and production of pilot vehicles for its particular class . Subsequently, as already mentioned , other concerns were obliged to build its model (s). Since the types developed by these manufacturers were made later by a number of other firms, however, the mark type is not a reliable guide to the original manufacturer-whose name could nevertheless be found on the vehicle name-plate. The very early models were noted for their extremely short track sections (half-tracks), but later models had the track section lengthened to improve cross-country performance (three-quarter-tracks). The earlier models also had leaf-spring suspension; but some of the later versions adopted torsion bars carrying cranked carrier arms. All models in the 1- and 3-ton classes had this type of suspension. The semi-tracks were designed so that the sides of the body were sufficiently high to obscure seated personnel to shoulder height. With all inspection hatches of the hull closed, the main body of the vehicle was practically watertight when traversing deep water. 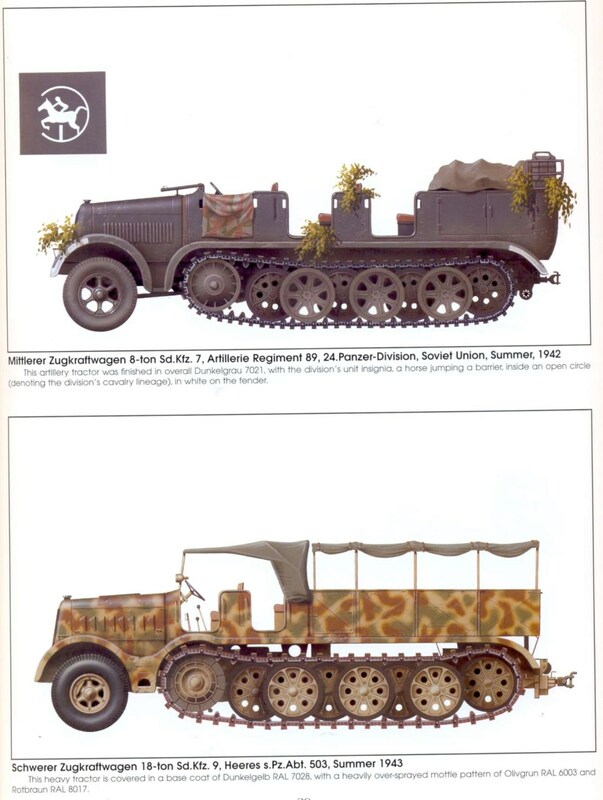 Development of this first generation of semi-tracks reached a satisfactory conclusion by 1939, the models then in production being continued throughout the war with only minor modification (with the exception of the 5-ton model, which was eventually superseded by the S.W.S). Some of these vehicles were supplemented by Maultier (mule) vehicles. This small motor-cycle tractor, designed by Wa. Pruf. 6, was developed by NSU during 1939. 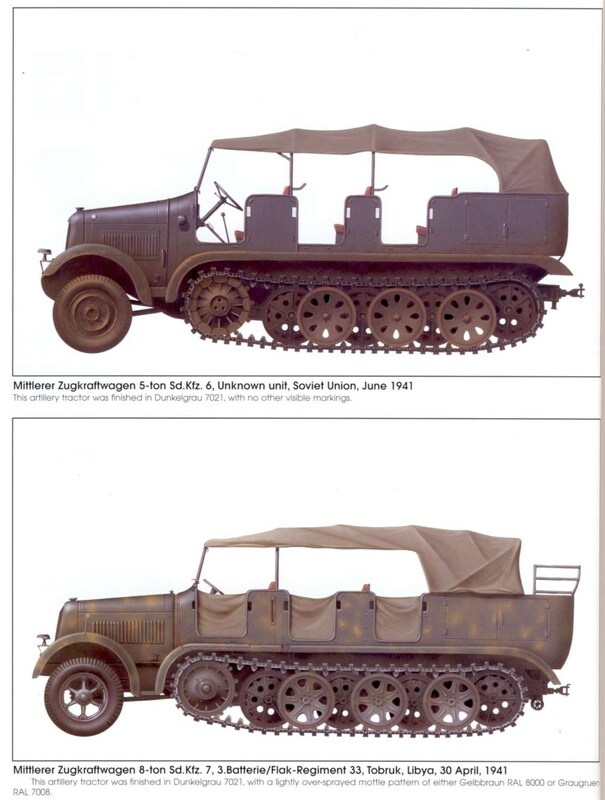 It was intended mainly as a light air-portable tractor for towing the light guns and single-axle open supply trailers of paratroop and airborne un its, but it was also used as a despatch vehicle in localities unsuitable for wheeled vehicles. It first saw action during the invasion of Crete. 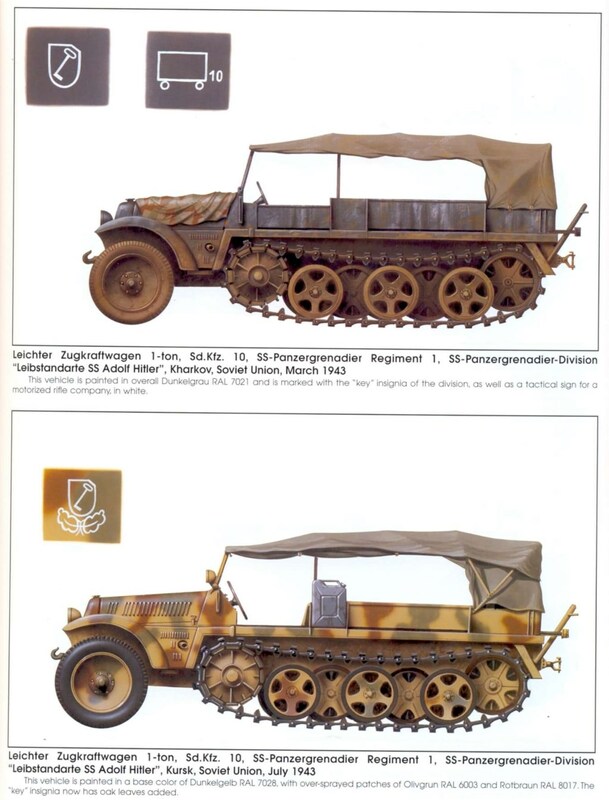 The development of the Kettenkraftrad was based on the Motorkarette built by Austro-Daimler (later SteyrDaimler-Puch) for the Austrian Army-which had steel tracks and lever-controlled steering and could be transformed into a wheeled vehicle by the manual application of pneumatic-tyred wheels to spec ial axles provided on the chassis. 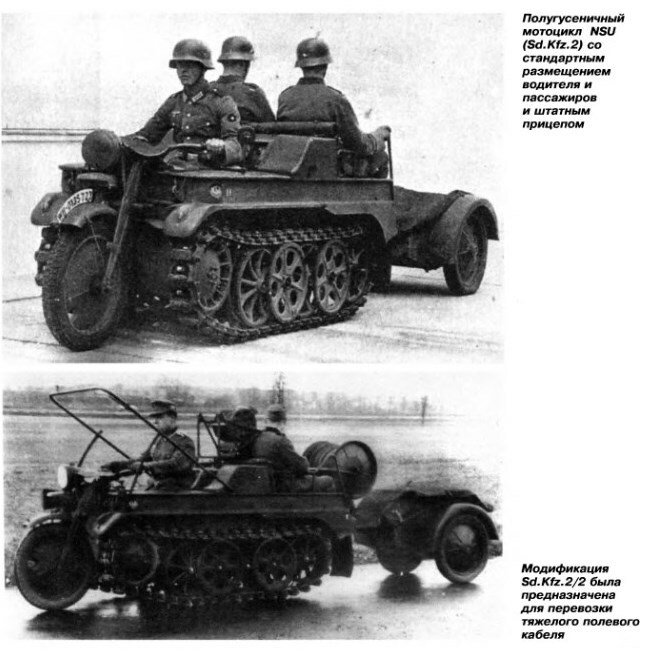 By introducing steering brakes, reducing the track width and introducing the normal motor-cycle steering system at the front, NSU transformed the Austrian vehicle into one conforming to German military requirements. The prototype was designated Versuchs Kfz. 620; but when standardised the vehicle was classified as the Sd. Kfz. 2 Kleines Kettenkraftrad , with the series project number HK100. It entered service on 5th June 1941 and thereafter served mainly as a supply vehicle for rough terrain conditions. It remained in production until 1944. 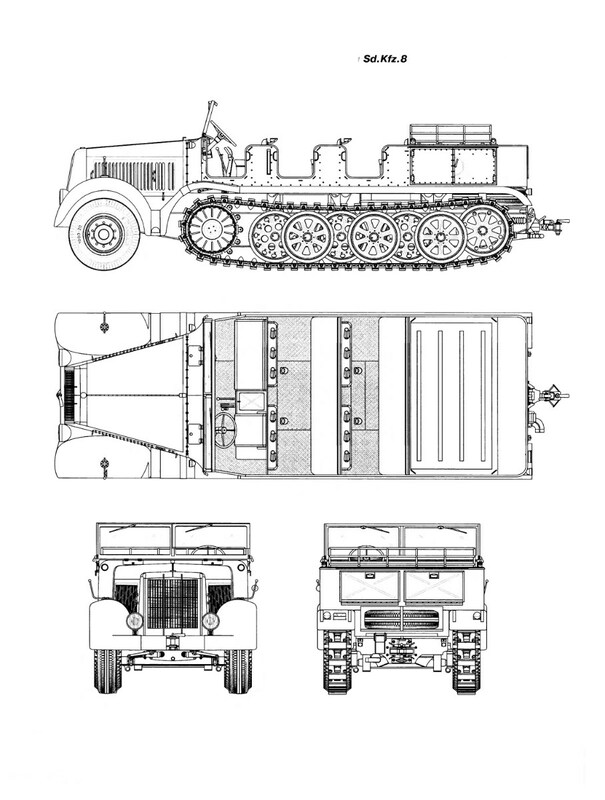 The mobility of the vehicle was as good as most tanks; and its ability as a light prime-mover, because of its wide gear selection, was very good. Production was shared between NSU in Neckarsulm and Stoewer in Stettin, and 8.34S were built in all. It was intended that production should also be taken over by Simca, but this never materialised. 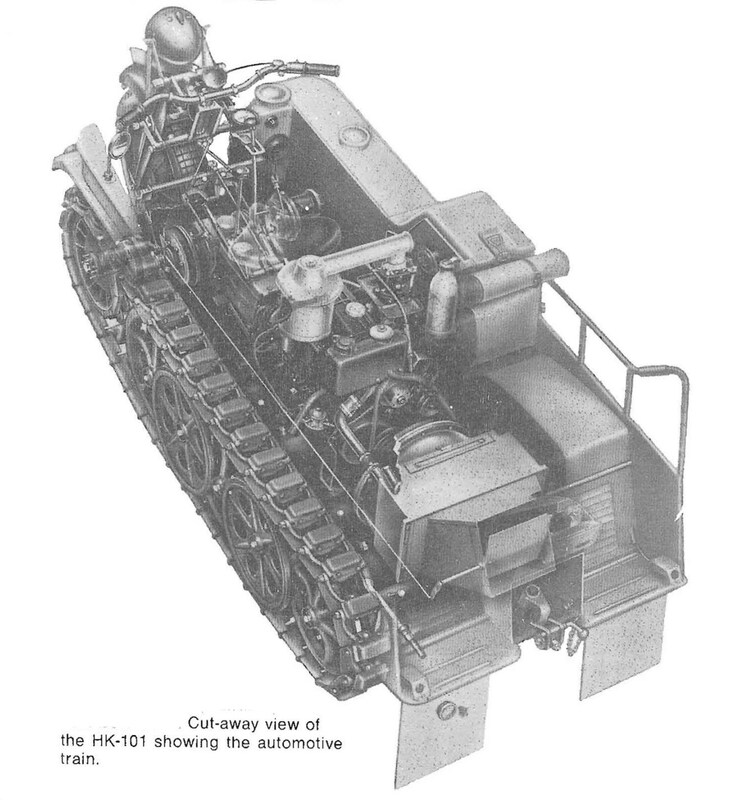 Essentially, the vehicle retained the standard front wheel and handle-bars of a conventional motor-cycle but had two caterpillar tracks in place of the rear wheel. The front wheel steered the vehicle through slight angles, but controlled-differential steering brakes took over thereafter. The chassis was a box-like structure of pressed steel in two sections, welded together in a horizontal plane below the track guards. It contained the driving compartment, the engine and transverse seating accommodation for two men facing the rear. A hand-rail was provided on each side at the rear. The driver was seated on a saddle-seat directly above the transmission and clutch housing . Petrol tanks were mounted on each side and, together with the battery and tool compartments, made up the side walls of the vehicle. The engine was a centrally-mounted Opel Olympia 4-cylinder (positioned back-to-front) water-cooled petrol engine developing 37bhp. It was mounted behind the driver’s seat and therefore could not be cooled by the slipstream , so it was cooled by a radiator with a shaft-driven fan coupled to the crankshaft at the rear. It drove the front sprockets through a transmission giving six forward gears and two reverse gears. The suspension consisted of two straddle-mounted, rubber-tyred bogie wheels on torsion-bars, a front driving sprocket and a rear idler. The inner bogie wheels were of the hollow spoked type, and the outer wheels were of the removable disc type. The tracks had 40 links each and were equipped with needle-bearings and replaceable rubber pads. At a slightly later date, two cable-laying versions of this vehicle were introduced into service. They were: Sd.Kfz. 2/1 Kleines Kettenkraftrad für Feldfernkabel (light motor-cycle tractor for field telephone cable). Sd.Kfz. 2/2 Kleines Kettenkraftrad für Schweres Feldkabel (Iight motor-cycle tractor for heavy field cable). Both vehicles had cable-drums mounted on frames behind the driver’s seat. A crane version was also produced in small numbers. During 1941 NSU undertook a project for a heavier version of this vehicle with an increased load-carrying capacity and five seats (excluding the driver’s). It weighed 2,2S0 kg, was powered by a 2-litre 4-cylinder Stump K20 engine developing 65hp, and was designated the HK102 (Grosses Kettenkraftrad). But it never progressed beyond the prototype stage. A further engine was also being developed for the HK101, to replace the Opel. It was a 600cc 3Shp (metric) 4-cylinder in-line short-stroke engine with a kick-start. One interesting variant of this vehicle was the NSU Springer, which was used as a radio-controlled demolition vehicle. This entry was posted in Germany, Weapons by MSW. Bookmark the permalink.